a labourer (q.v.) on a fruit farm. a labourer (q.v.) on a fruit farm who sprays fruit trees and plants with solution containing chemicals as a protection against disease; usually also lime washes trunks of trees, and does other work connected with fruit growing. assists gardener (013) in unskilled work, e.g., weeding, watering, sweeping lawns and paths, burning rubbish. does unskilled work about a garden, nursery, orchard, etc., e.g., digging, planting, manuring, hoeing, picking and spraying fruit trees, lifting and drying bulbs (on bulb farm); sometimes specifically designated, e.g. bulb farm labourer, fruit farm labourer, fruit plantation labourer, nursery labourer, orchard labourer. a cottager (024) (q.v.) who works as labourer in nursery, market garden, etc. digs and drains land, plants shrubs, etc., and makes paths under supervision of landscape gardener (013) (q.v. ); does any other unskilled work in connection with laying out of new garden. Scottish term ; a gardener's labourer who assists in keeping the policies or grounds surrounding the house on a large estate. cuts grass lawn usually by pushing a machine or driving horse or pony drawn machine; cf. motor lawn mower driver (013). a casual worker who ties up rhubarb in bundles with osiers or bass for despatch to market. 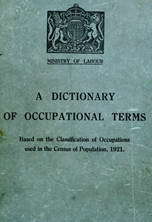 digs and does other unskilled work in nursery, market garden, etc.